The events of Holy Week unfold as a social drama. Jesus rides a donkey into Jerusalem from the east, in direct contrast to the Roman imperial legions that require palm demonstrations when they arrive from the west. There is a shared meal among friends, a confrontation, a trial, an execution, a denial by the closest of friends, a resurrection. The week is filled with street theater. ISAIAH, a coalition of about 90 congregations bringing a social justice message to the Minnesota legislature, offered a 2013 version of this same style on Maundy Thursday, March 28, in Brooklyn Park, Minnesota. 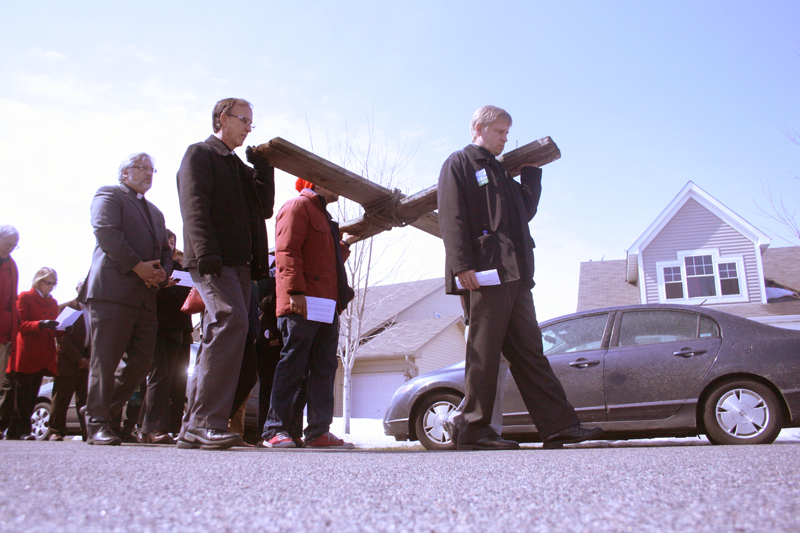 A procession of clergy and lay leaders, carrying a large cross, marched through suburban streets to a house on Toledo Avenue that had gone into foreclosure and been empty for two-and-a-half years. Laying the cross in the unshoveled driveway, they prayed for the more than 141,000 Minnesotans who have experienced the foreclosure of their homes since 2008. “Tonight, Christians gather in churches throughout the world to remember our Lord Jesus’ Last Supper with his disciples, when he washed their feet and commanded us all to ‘love one another’,” said the Rev. Jim Erlandson, Lutheran Church of the Redeemer, St. Paul, when calling together the procession. “This Maundy Thursday and Good Friday, we hear once again the story of Jesus’ betrayal, his humiliation, and death on a cross. Families throughout the state of Minnesota have also experienced betrayal, shame, and marginalization when they lose their homes to foreclosure. We come to repent and resolve to do better. According to Erlandson, the Maundy Thursday procession didn’t come out of nowhere. He said that ISAIAH and partner organizations have been hosting a Prophetic Voices presence at the state capitol for the 40 days of Lent. 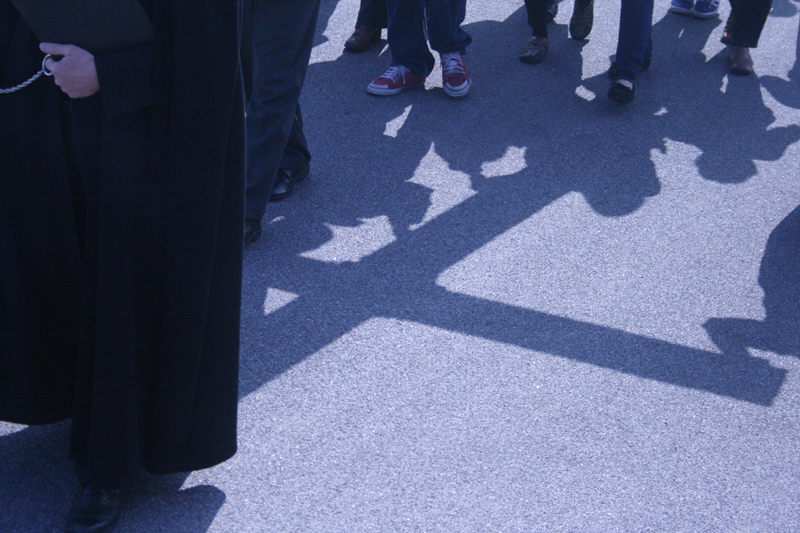 “Each participating church during Lent spent time visiting legislators at the capitol with a number of concerns. Often [these religious leaders] mentioned their support for a homeowners’ bill of rights in their conversations,” he said. During Holy Week, there is a shared meal among friends, a confrontation, a trial, an execution, a denial by the closest of friends, a resurrection. • ensures the right of homeowners to take banks to court to enforce an end to wrongful foreclosure and eviction. The Rev. Chris Becker leads ISAIAH members in a time of confession as part of a Maundy Thursday event. A home in foreclosure loses 22 percent of its value. On average, that is a $48,180 loss. But neighboring homes within an eighth of a miles also lose $1,971 in value, according to “The Wall Street Wrecking Ball,” a report published by a coalition of groups involved in the foreclosure crisis. These numbers were very real for the group of marchers on Maundy Thursday. 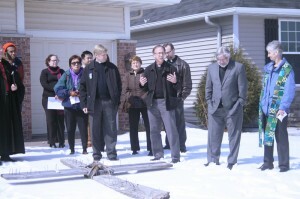 “We have 16 people on staff, and three lost their homes due to the loss of their spouses’ jobs,” said Fr. Mike Sullivan, St. Joseph the Worker Catholic Church, in Brooklyn Park. “We need to stop the bleeding,” an all-too-graphic illustration during Holy Week. Supporters still hope the Minnesota legislature will take action. “It’s late in the session, but it is still possible,” said the Rev. Grant Stevensen, a leader with ISAIAH. “ In the late 1980s, the banks opposed mediation with farmers [during the farm crisis], and they fought it hard,” he said. “Now the banks admit it was good legistlation. “In five years, the banks will say [the Homeowners’ Bill of Rights] is good for people, good for communities, and ultimately good for banks. “It will be the same as with the farm foreclosures,” Stevensen offers.